Java JRE is a constant target of malware and often riddled with security flaws. Oracle is constantly pushing out new versions of Java and many computers automatically update themselves over the internet but that is not always the case. This article will walk you through using the scripting features of Bozteck VENM to push the Java run-time over the network to all of your computers so that they are all on the latest updates as they are released. 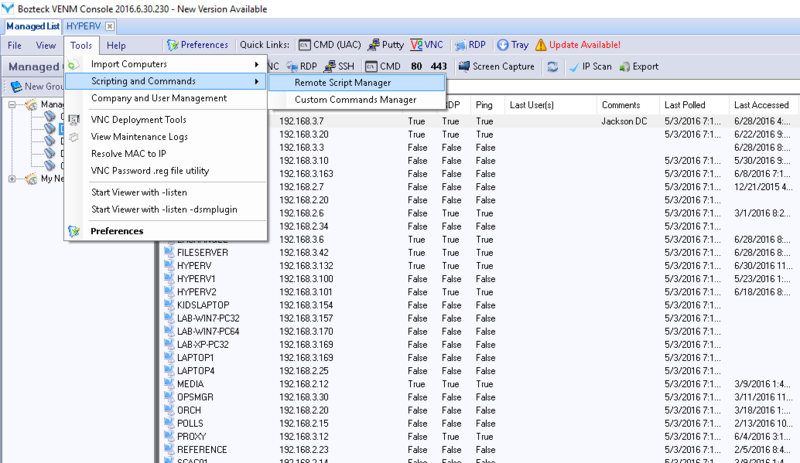 Bozteck VENM is a remote desktop management tool that has the ability to push installers and scripts over the network to remote computers and perform silent installations on them. We will use this feature to push and install Java. Once you have downloaded and installed Bozteck VENM, you will want to add a service account that has Administrator level access on the computers that you will be pushing these scripts to. You can read the quick getting started guide here. To download the latest version of Java, you will want to head to the Java download page and get the Windows offline (or Windows Offline 64 bit) version. If you would like to push an older version you can download them here. The file that we will be working with will be named jre-8u91-windows-x64.exe. 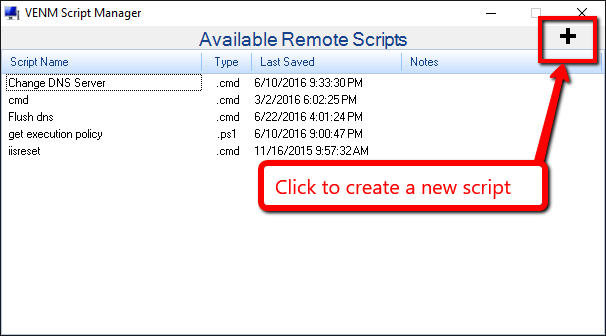 From the main VENM window (above), choose to open the Remote Script Manager from the Tools menu. 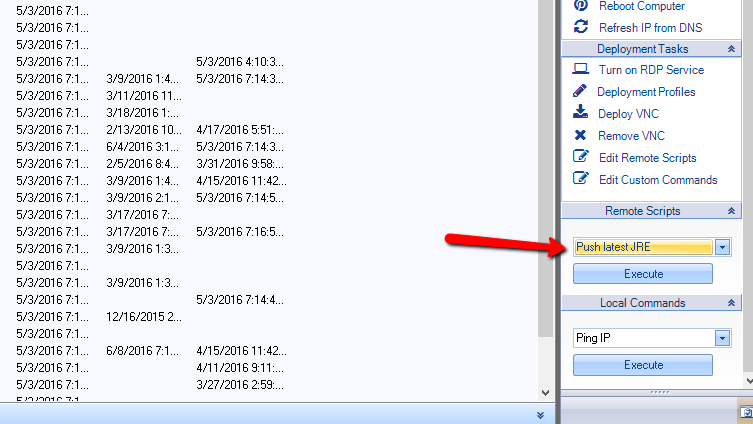 Click the Add file(s) button and browse to the location where you downloaded the Java run time installer. 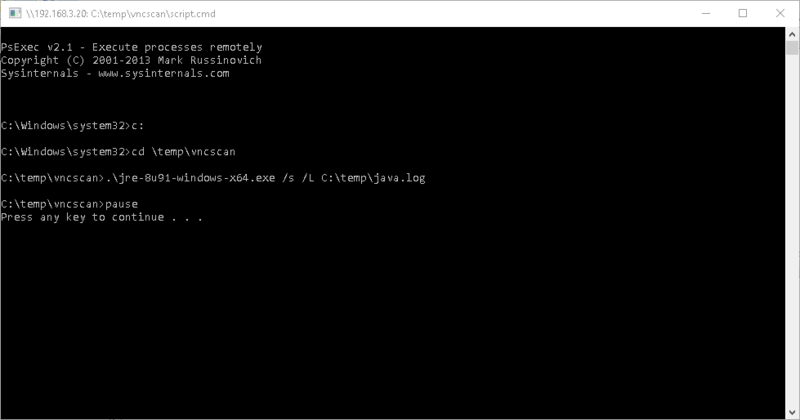 This file will be copied to the c:\temp\vncscan directory on the remote computer when it is deployed. Paste the script below into the text window and then save the script. Back in the main Bozteck VENM window, select the computer(s) that you would like to deploy Java to. With the computers selected, select the script as shown above and click the Execute button. If you have not done so, yet, you will be prompted to add a service account that the scripts will run as on the remote computers. 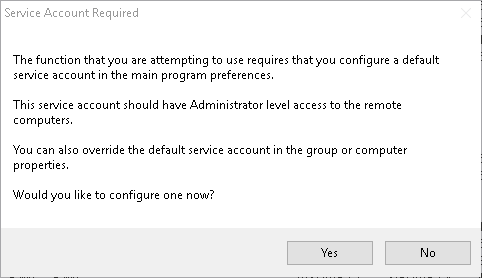 Make sure that this account has full Administrator access on the remote computer(s). If you have completed all of the above steps properly, you should see the command window below executing the script remotely. 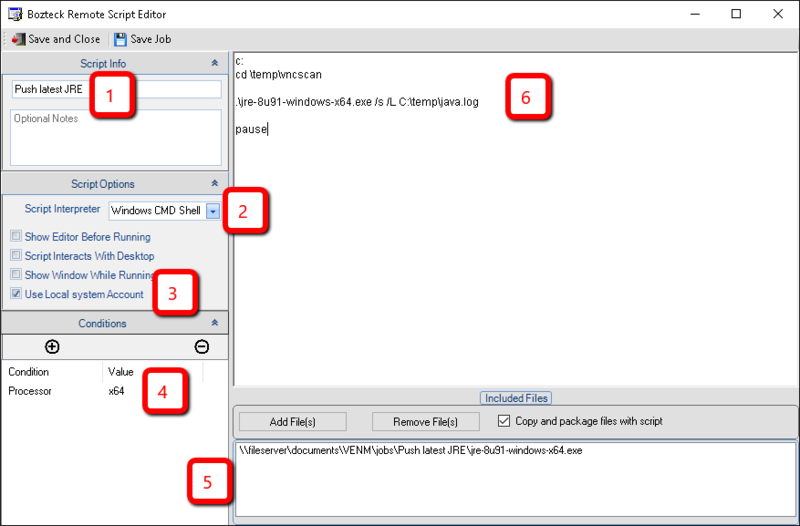 This entry was posted in how-to, howto, Support and tagged bozteck, deploy java runtime, java, jre, push deploy java, push java jre, remote desktop manager, runtime, silent java installer. Bookmark the permalink.